Recently we have came across a short story collection titled Obsession: Eternal Stories Of Life And Death. This collection hold stories from four different authors Gurpartap Khairah, Bishwa Sigdel, Stormy Hazarika and Suraj Sinha. In this segment we are reviewing the short stories by Stormy and Bishwa. One common thing you can find in almost all the stories, is the mention of Nepal. As one of the author is from Nepal, it is obvious though. 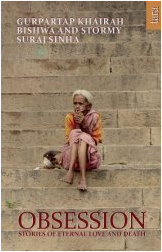 This is very heart touching tale of a widow who came from her native in Nepal to Banaras. Her aim was to find the inner peace and get detached with almost everything moral. Banaras (or Kashi, Varanasi) is the ideal destination for those who seek the peace for their soul. It the place where people come to get detached from material world and just think about doing best for the soul. After staying for around 3 year in the city, the lady have developed habit of rising early, got her routine done and may be passing the time praying the God or doing some rituals. But, is it easy to get detached from tempting possessions. Be it material objects or relatives. Aren’t younger kids in the family, the innocent toddlers, one of the reasons to live? Will she get ultimate solace? Was she able to get herself detached from the material stuff? The stuff is explored really well. The end of the story is fascinating and heartwarming. The philosophy of great religious stuff summarizes nicely in those two lines. A not to miss story, if you like the philosophical reading. The high expectations set from the first story – Ripe Mangoes – are satisfied when reading the initial segment of this story. The end is heart breaking though!!! In real world however you often see such ends, so it is realistic. The hard life of “Bhariya” is explored pretty realistically. The struggle they go through is really heart touching. The kid’s (Can we say him a kid? He does hard work like a grown man!) efforts, his feelings of being lonely is good reading material. The “March Marched…” – is the best sentence of the story. The way he misses his mother and a young girl from his native is written well. How his father initially cares for him and asks him that his body will eventually develop habit of this hard work, is realistic. The end of the story is something you found shocking. Also some attributes mentioned in the end are half backed. Of course this is not the ideal world, but you rather want this story to end in positive note, which it doesn’t. The third story from the same writers duo, fall in a different area. It revolves around a pub, a lady working there and a man visiting it regularly. The developing friendship between them and the man’s attraction toward to girl. The writer tried well to not to include the abusive stuff, but again not everyone like a story set in this background. The growing relationship could have been explored in better ways. The little adult stuff come between, is the demand of the story and hence justify its placement. But the title of the story is what it is uttered by the girl at a point. The end is again what you don’t expect. Though in real life, we see such stuff being happened. It the end could have been changed, the story could have been better. The last lines uses the metaphor of red color Saree and red blood pretty interestingly. We have also noticed that over the course of book, the stories getting richer in linguistic stuff. The Last Card is quite for an adult audience. It is rather a filmy looking story than sounding that of the realistic. Some of the stuff is mentioned really well in the story, in terms of linguistic attributes. The filmy style of meeting of two different people and their fall in love; their marriage; it all completes in a few paragraphs. And that is fine. The real life takes the toll afterwards. The male protagonist was kicked off from the job and the lady have to handle the home later. There come a shocking event in their life. And to get out of the same the lady have to do something, she doesn’t willingly want to (Remember a similar situation in recent Hindi film Table No. 21)?! It is the end which is shocking. The story is rather pessimistic. It have some good linguistic attributes though. You may like it if you enjoy filmy thrills, otherwise you may skip it. Yellow Tears is a story of a youth who wanted to study literature and the sudden death of his father made him to do something else. As there is no one to look after the restaurant business started by his father, his mother insist him that it is his “duty” to get involved in the business and look after the family as well. Not convincing by heart he works at the business but was unable to make up his mind. He was unable to concentrate in Hotel Management studies. And to worse his experience, his meeting with his friend who was lucky enough to study what he wanted, makes him more depressed. He chose the wrong way to go through. He though got caught by his friend and hence he wanted to find other way to consume drugs, which prove fatal for him! The story never talks about having positive attributes towards the life. Life doesn’t run in the way we want. One has to face the situations and have to adjust to the same. But at the same time, one should control him/herself and need to put in extra effort to get out of the wrong situations and drive his/her own life towards the right path and one day he/she may achieve what he/she deserve. The story represents the situation of aimless youth who almost lost control over himself. So the story basically tells what not to do. If you want to learn from other’s experience, you may read it (with the vision to learn what not to do). If you know what is right and what is wrong, if you already have wisdom and positive attitude in life, there is nothing in the story to appeal you. The last story is the richest one in terms of linguistics. It has some remarkable lines to go for. The story shows transformation of a person in something he hate (and hence doesn’t want to be). He cannot control himself from not being the one. The mind and psychology is something really interesting and sometimes beyond imagination and control. Sometimes one unconsciously does what he doesn’t want to. The story gives a simple message. Don’t try too hard for some stuffs. Sometimes it is better to just let it go. Some of the stuff in the story is little boring and sometimes it seems the story is loosing the path. But the end is work positively for the story, making it a good read. For the stories by these two writer we can say they very in quality and content. Some of them we like and some of them we don’t that much. However we can say overall the stories are readable. You will enjoy reading a few of them. 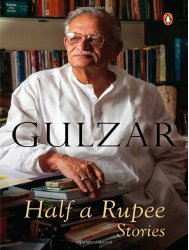 The second and final part of the reviews for this book (for the stories by Gurpratap Khairah and Suraj Sinha) is now available here.